Sanford and Son is an American sitcom that ran on the NBC television network from January 14, 1972, to March 25, 1977. It was based on the BBC Television program Steptoe and Son, which had its original broadcast run in the United Kingdom from 1962 to 1965. Known for its edgy racial humor, running gags, and catchphrases, the series was adapted by Norman Lear and considered NBC's answer to CBS's All in the Family. Sanford and Son has been hailed as the precursor to many other African-American sitcoms. It was a ratings hit throughout its six-season run. While the role of Fred G. Sanford was known for his bigotry and cantankerousness, the role of Lamont Sanford was that of Fred's long-suffering, conscientious, peacemaker son. At times, both characters involved themselves in schemes, usually as a means of earning cash quickly to pay off their various debts. Other colorful and unconventional characters on the show included Aunt Esther, Grady Wilson, Bubba Bexley and Rollo Lawson. Sanford and Son stars Redd Foxx as Fred G. Sanford, a widower and junk dealer living at 9114 South Central Avenue in the Watts neighborhood of Los Angeles, California, and Demond Wilson as his son Lamont Sanford. In his youth, Fred moved to South Central Los Angeles from his hometown of St. Louis. After the show's premiere in 1972, newspaper ads touted Foxx as NBC's answer to Archie Bunker, the bigoted white protagonist of All in the Family. Both shows were adapted by Norman Lear from BBC programs. Sanford and Son was adapted from Steptoe and Son and All in the Family from Till Death Us Do Part. An earlier pilot for an American version of Steptoe and Son was produced by Joseph E. Levine in 1965. Starring Lee Tracy and Aldo Ray as Albert and Harold Steptoe, it was unscreened, and did not lead to a series. The pilot was released on DVD in the UK in 2018. As the series progressed, it focused more on Fred's antics and schemes, with Lamont often adopting the role of the gentler, more open-minded progressive who attempts to broaden his father's horizons. A notable example of the softening of Lamont's character is his change in attitude towards Donna Harris (Lynn Hamilton), Fred's girlfriend. Early in the show's run, Lamont derides her as "the barracuda" and is openly hostile towards her, attempting to ruin her relationship with his father at least twice. In a later episode, however, Lamont invites Donna to dinner with himself and his girlfriend, remarking that it would do his reputation good to be seen with "two lovely ladies." Similarly, Fred is initially depicted as a man who, though not always ethically or culturally sensitive, has the wisdom of experience and significant street smarts. As the series progressed, Fred got into increasingly ludicrous situations, such as faking an English accent to get a job as a waiter, convincing a white couple that an earthquake was really the "Watts Line" of the then-nonexistent L.A. subway (a wordplay on the common phrase "WATS line"), taking over a play featuring George Foreman, or sneaking into a celebrity's private area, such as Lena Horne's dressing room or Frank Sinatra's hotel room. Some of these situations revolve around Fred's trying to make a quick buck. Perhaps the best example of this bond between father and son occurs in the episode where a friend from Fred's past shows up and claims to be Lamont's real father. After hearing the news, Lamont tells a tearful Fred that he is "the only pop I've ever known" and as far as he is concerned, it is "always" going to be Sanford and Son. (In the humorous twist that closes the episode, it turns out the friend had actually slept with Aunt Esther, thinking she was her sister Elizabeth.) Lamont's birthday is mentioned in the third-season episode "Libra Rising All Over Lamont" as September 27, 1940. However, in a season-five episode called "Ebenezer Sanford", Lamont says his birthday is in February. In yet another episode, Fred says Lamont was born in 1942. Redd Foxx played Fred G. Sanford (named after Redd Foxx's [real name John Elroy Sanford] brother, Fred), portraying him as a sarcastic, streetwise, irascible schemer whose frequent get-rich-quick ideas routinely backfired. His son Lamont longs for independence, but loves his father too much to move out and leave the trouble-prone Fred unsupervised. Though each owns an equal share in the business (technically Fred is the boss), Lamont often finds himself doing all the work and demanding his father complete tasks and duties, which he almost never does. Fred often insults his son, usually calling him "dummy". Lamont returns the favor, referring to Fred as an "old fool". Despite their disagreements, the two share a close bond and regularly come to each other's aid. An episode in the second season featured a plot in which Fred and Lamont had a heated argument over the business; Lamont quit and went to work for one of his father's business competitors. Meanwhile, Fred filled Lamont's position with a slacker who squandered Fred's money on a worthless item. When Lamont quits his new job and Fred fires the slacker, the two decide to reform their partnership, though each is too proud to admit he could not make it without the other. According to Fred, his wife Elizabeth died around 1950. In a running gag in the series, during times of distress, Fred looks up (as to heaven) with his hand across his chest, faking a heart attack and saying, "This is the big one, Elizabeth! I'm coming to join ya, honey." No one, however, falls for this transparent ruse. Fred raised Lamont alone and missed Elizabeth deeply. According to Fred, his son was named for Lamont Lomax, a pitcher from the Homestead Grays. In one episode, Lamont asks why he did not have a middle name; Fred tells him that Lamont is his middle name: Elizabeth and he never came up with a first name. However, in the third episode of the first season, Lamont was revealed to be named "Lamont Grady Sanford". Initially, Fred's main antagonist on the show was his sister-in-law and Lamont's aunt Ethel (Beah Richards). Ethel's involvement in the Sanford family squabbles lasted until midway through the second season, when she was replaced in the cast with her more tart-tongued sister Esther (LaWanda Page). Fred and Esther's relationship as in-laws became a major part of the plot. The two frequently traded insults, usually instigated by Fred, who contorts his face upon Esther's entrance and describes her with disparaging and colorful metaphors (such as comparing her to King Kong). The deeply religious, no-nonsense Esther typically responds to Fred's insults by scowling, saying "watch it, sucka! ", referring to him as "you old heathen" or "old fish-eyed fool", or even attacking Fred with her purse when he continues his remarks. Esther's disdain for Fred goes back to when Elizabeth and he were dating; she disapproved of Fred's marrying her sister. Despite his stubbornness and irascible nature, Fred sometimes redeems himself with acts of kindness, even to those (like Esther) whom he insists he does not like. In the last episode of the series, Fred earns his high school diploma, and is the valedictorian of his graduating class. Earlier in the show's run, it more closely adhered to the format of its British predecessor Steptoe and Son with 16 episodes (12 in season one and four in season two) being remade from the original "Galton and Simpson" scripts with Fred and Lamont often at odds over various issues. Fred and Lamont also are depicted as being equally manipulative. Fred manipulates with constant threats of "the big one" and avoids manual labor due to his "arthur-itis". In earlier episodes, Lamont through various antics would try to drive a wedge between his father and Fred's girlfriend Donna Harris (Lynn Hamilton), of whom he disapproves because he thinks she is trying to usurp his mother's place. Demond Wilson played Lamont Sanford, who is depicted at times as the greedier of the two. In one episode, for example, he refuses to sell two coffins for less than what he thinks they were worth, despite the fact that even possessing them upsets his superstitious father. Lamont sometimes receives his comeuppance for being disdainful of his father's habits and ways. (One example of this is the time Lamont is upbraided by a Nigerian woman who considers his attitude towards Fred to be disrespectful.) There are moments when Lamont is shown to be naive and foolish, such as the episode where he invites his new "friends" over to play poker. His street-savvy father immediately recognizes that they are card sharps, out to cheat Lamont after they gain his confidence by letting him win a few smaller-stakes games. After Lamont has lost all of his money, Fred turns the tables on the scammers by pretending to be ignorant of poker himself, agreeing to play a few hands and then taking all of their money by means of a marked deck of cards and special glasses that allow him to see what he is dealing. A similar predicament befalls Lamont in the second season when he gets involved in an unethical deal by purchasing a possibly valuable Regency commode from a woman for a rock-bottom price, then selling it back to her husband at 10 times the price. He then takes an offer from a third party for quadruple that price while Fred tries over and over again to warn him that he is doing something immoral. Lamont becomes so angry that he threatens to lock Fred in his bedroom. Finally, due to some investigation on Fred's part, Lamont is shown to have been scammed, the pot is a fake, and the culprits have made off with several hundred dollars of Lamont's money. One constant with Lamont (particularly in the second season) is that he is always trying to find new ways to move up in the world and away from the junk business, like his British counterpart Harold Steptoe (played by Harry H. Corbett), but he often is thwarted by Fred's interference. In the first episode, he buys a possibly valuable piece of porcelain from an elderly woman in Beverly Hills with the intention of selling at auction. However, Fred messes things up at the auction, and Lamont ends up buying the piece back from himself. In the second season, Lamont buys a war rifle from the American Revolution at an auction with the intent to sell it for thousands. While investigating it, Fred accidentally fires the gun through the front window, and Lamont and he spend all night wondering if he has accidentally killed the neighbor across the street who appears to be missing. In a panic, Lamont melts the gun down before realizing that the neighbor was just out of town. In one episode, he attempts to become an actor, Lamont and Rollo answer an ad for wannabe black film actors for an independent film company, only to realize that it is really a pornographic film factory. In another episode, he answers an ad to travel around the world working on a tramp steamer, which would mean putting Fred in a nursing home, but Fred tricks him into not going. During the third season, Lamont attempts to open a side business with Julio, selling used automobile parts. Fred is so upset that he leaves and moves into a flop house. Lamont eventually convinces Fred to come home, but whether or not he left the new business venture never is addressed. The most significant change in Lamont's character throughout the series was his attitude toward his work, his father, and his future. In the first episode, he is portrayed as hostile and angry toward Fred and the life he is forced to live, especially when Fred's interference ruins his plans, similar to the relationship of Harold Steptoe and Albert Steptoe. This lasted through the middle of the first season, especially in an episode when he takes Fred out on the town for his birthday and becomes frustrated by Fred's lack of manners and crudeness in public. At the end of the night, he becomes so angry that he abandons Fred at the restaurant, leaving his father to walk home in the rain. His attitude towards Fred softened by midseason, as episodes tended to focus more on the two working together to solve a problem, as when several bill collectors converged on the house threatening to repossess their belongings. He changed throughout the series and became a man dedicated to his work and to his father, but also who would try new things and new ideas to better himself, such as when he attempts to embrace his African heritage or later when he tries to run for state assemblyman. Esther Anderson (LaWanda Page), also known as Aunt Esther, is the Bible-toting sister of Fred's late wife Elizabeth. Esther is a staunchly religious individual who finds little use for humor, though she is kind and loving towards Lamont. Fred and Esther dislike each other intensely. Fred's trademark response to Esther's entrance is to make an exaggerated grimace followed by colorful insults and comparisons to various animals ("Esther, I could stick your face in some dough and make gorilla cookies") and fictitious monsters such as King Kong (often referring to her as "Esther Kong") and Godzilla. Her usual reaction to his antics is to scowl and exclaim "watch it, sucka!". Other times, she will threaten Fred with violence, with phrases like "I'll knock you so far down in your socks, you'll think you wearing a turtleneck sweater! ", or she swings her purse at Fred while angrily calling him "old fish-eyed fool" or "old heathen". When leaving the Sanford home, she often exclaims "oh glory!" or "hallelujah!" Her long-suffering but loving alcoholic husband Woodrow (played by Raymond Allen) began appearing infrequently later in the series. Woodrow eventually became sober so he and Esther could adopt a young orphan, played by Eric Laneuville. Fred and Esther called a temporary truce, of sorts, in the episode "My Fair Esther." Esther first appeared in early 1973, in the 29th episode of the series ("The Big Party"), and would eventually replace her sister Ethel (Beah Richards), the first main in-law character. Bubba Bexley (Don Bexley) is another of Fred's friends who appears frequently, alternating with Grady as Fred's best friend. Bubba is known for his infectious belly-laugh and jovial personality. Bubba is primarily a straight man to set up punchlines for Fred. His loud greeting of "Hey Fred!" drives Fred and Lamont crazy. His function in several episodes is to encourage Fred's get-rich-quick schemes, as when he tells Fred to fake having whiplash after he is hit by a white man in a Cadillac while driving the truck. In the episode "Lamont Goes African", Bubba reveals that he is originally from Memphis, Tennessee. Rollo Lawson (Nathaniel Taylor) is Lamont's best friend. Fred will often make disrespectful remarks towards Rollo, usually stating that he thinks Rollo is a criminal, as Rollo had spent time in jail. At one time, when Rollo introduced Lamont to his African cultural heritage, Fred thought it was a scam and noted that "If there was money to be made, Rollo would become an Eskimo". Rollo's mother Rita is an unseen character sometimes referred to when Rollo's name comes up and someone asks "Is that Rita Lawson's boy Rollo?" and she is also friends with Lamont's aunt Esther. Donna Harris (Lynn Hamilton) is Fred's on-again, off-again girlfriend who later becomes his fiancée. She is employed as a practical nurse. Donna is an amiable, even-tempered lady who takes in stride Fred's shenanigans and occasional trysts. She also appears to be more sophisticated in contrast to Fred's rather blunt and boorish personality. Lamont, being the overprotective son, mistrusts Donna at first (branding her as "The Barracuda"), but by Season 6 has completely warmed to her. Esther is hostile toward Donna at first, almost coming to blows with her during their first meeting on Donna's and Fred's wedding day (an event that causes the cancellation of the wedding). Eventually, Esther warms to her as well. Julio Fuentes (Gregory Sierra) is the Sanfords' Puerto Rican next-door neighbor who befriends Lamont. When Julio and his family move in next to the Sanfords, Fred takes an immediate dislike to them and remarks, "There goes the neighborhood." Despite Julio's friendliness, Fred often makes insulting ethnic jokes about Julio and openly wishes he would return to Puerto Rico, despite the fact that Julio is originally from New York City. Despite the contention, Fred does stand up for Julio's nephew at his elementary school, which has threatened to drop him to a lower grade due to lack of proficiency in speaking English; Fred tutors him for some time as well. In the fifth season, Julio moves away. The Sanfords buy his former home and convert it into a boarding house named the Sanford Arms. Ah Chew (Pat Morita) is a Japanese-American friend of Lamont whom Fred belittles every chance he gets. Fred insults Ah Chew on numerous occasions using clichéd Oriental jokes. Fred actually befriends Ah Chew in a later episode because he wants to use him as a cook when he opens "Sanford and Rising Son", a Japanese restaurant in the Sanford house. Despite this arrangement, Fred still hurls verbal abuse at Ah Chew. In the fifth-season episode "Sergeant Gork", Morita portrays Colonel Hiakowa, in a flashback where Fred tells Roger, Lamont's fiancée's son, of his supposed heroism in World War II. Officer "Smitty" Smith (Hal Williams) is a police officer who occasionally show up at the Sanfords' residence. Often, Hoppy incorrectly uses 'jive' slang, which Smitty corrects — e.g., "cold" instead of "cool" or "right up" instead of "right on." Conversely, the ever-professional Hoppy delivers a speech filled with police jargon and big words, which confuses Fred and/or Lamont thus turning to Smitty, who would translate Hoppy's speech into jive. Later in the series's run, the officers often appear individually. Unlike Ah Chew and Julio, Hoppy remains free of Fred's usual insults. In one episode, "This Little TV Went to Market", Officer "Jonesy" Jones (Bernie Hamilton) appears with Hoppy in place of Smitty. In the sixth-season episode "The Hawaii Connection", Smitty appears with his slow-witted new partner, Percy (Pat Paulsen). In "The Reverend Sanford", comic Freeman King appears as a police officer named Jim, presumably standing in for Smitty, but without Hoppy or any other partner. Officer Howard "Hoppy" Hopkins (Howard Platt) is a police officer who occasionally show up at the Sanfords' residence. Often, Hoppy incorrectly uses 'jive' slang, which Smitty corrects — e.g., "cold" instead of "cool" or "right up" instead of "right on." Conversely, the ever-professional Hoppy delivers a speech filled with police jargon and big words, which confuses Fred and/or Lamont thus turning to Smitty, who would translate Hoppy's speech into jive. Later in the series's run, the officers often appear individually. Unlike Ah Chew and Julio, Hoppy remains free of Fred's usual insults. In one episode, "This Little TV Went to Market", Officer "Jonesy" Jones (Bernie Hamilton) appears with Hoppy in place of Smitty. In the sixth-season episode "The Hawaii Connection", Smitty appears with his slow-witted new partner, Percy (Pat Paulsen). In "The Reverend Sanford", comic Freeman King appears as a police officer named Jim, presumably standing in for Smitty, but without Hoppy or any other partner. Officer "Swanny" Swanhauser (Noam Pitlik) is originally Officer Smitty's Caucasian partner who is replaced early in the second season with Officer Hopkins. Swanny is basically the same as Hoppy, but his demeanor is much more serious and humorless. Like Hoppy, Swanny never is insulted racially by Fred. May Hopkins (Nancy Kulp) is Officer Hopkins' prim and proper mother who appeared in the fifth season. She is a retired store detective who rents a room at the Sanford Arms next door. Landlord Fred often insults her when she pays a visit. Much like her son, Mrs. Hopkins incorrectly uses jive slang, but the more experienced Hoppy corrects her. Janet Larson (Marlene Clark) is a divorcee Lamont begins dating in the fifth season. Janet also has a young son, Roger (Edward Crawford). The Larsons appear occasionally until Lamont and Janet break up in the sixth and final season, due to the return of Janet's ex-husband. Melvin White (Slappy White) is an old buddy of Fred's who appears in the first season. He appears in one second-season episode as well. Leroy & Skillet (Leroy Daniels & Ernest 'Skillet' Mayhand) are a rambunctious pair of Fred's friends who like to play poker, billiards or joke around. They appear in the second and third seasons. Otis Littlejohn (Matthew "Stymie" Beard) is a friend of Grady's who appears in the third and fourth seasons. George "Hutch" Hutton (Arnold Johnson) is an elderly tenant of the Sanford Arms who befriends Fred. When they first meet, Hutch admits to serving a lengthy sentence in prison to avoid his ugly sister-in-law. This immediately endears him to Fred. Fred is then disgusted when Hutch joins Aunt Esther's Bible study group. He appears in the fifth season. Dr. Caldwell (Davis Roberts) is the Sanford's family doctor who shows up in several early episodes. He often enters the Sanford residence with an alarming cough and his credentials as a doctor are questionable. Asked if he is really a doctor he claims "On Monday, Wednesday and Friday, I'm a doctor. The other days I work in the post office". Nelson B. Davis (James Wheaton) is a mortician who dropped by the Sanford residence several times in the second season, at one point to look at some caskets that Lamont picked up an auction. With a deep voice and a spooky laugh, he would often make odd quips in reference to his unusual profession: "It's been a slow week, business is dead" and "I must to return to my place, I'm a working stiff." Once he told Lamont that "Burial insurance is something that everybody digs." Reverend Trimble (Alvin Childress) is the soft-spoken minister of the Central Avenue Baptist Church who dropped by in the first two seasons, usually to officiate a wedding. The running joke was that every time he officiated a wedding for the Sanford family, the family usually ended up in a screaming match over petty disagreements which escalated into a war that left everyone fleeing the house in anger while the Reverend stood by in stunned silence. Frank Nelson appears as various comic foils to Fred in the fifth and sixth seasons using his catchphrase, "Yeeees?" Fritzi Burr appeared as various comic foils to Fred from the fourth season to the sixth. Sanford and Son was enormously popular during most of its run, and was one of the top 10 highest-rated series on American television from its first season (1972) through the 1975–76 season. With its coveted 8 p.m. Eastern Friday night time slot, Sanford and Son put enough of a dent into the middling audience of ABC's The Brady Bunch to drive it off the air in 1974. Sanford and Son peaked at #2 in the Nielsen ratings during the 1972–73 season and the 1974–75 season. The series was second only to All in the Family in terms of ratings during those years. 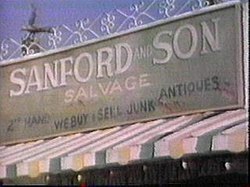 By the 1974–75 season, Sanford and Son's high lead-in helped the entire NBC Friday night lineup to place in the coveted bracket of the Top 15 shows (Chico and the Man, following Sanford, ranked #3 for the season, while the police dramas The Rockford Files and Police Woman aired later in the evening and ranked at #12 and #15 respectively). In the midst of taping episodes for the 1973-74 season, Redd Foxx walked off the show in a salary dispute. In 1973, Foxx was earning $19,000 per episode. His character was written out of the series for the rest of the season. The continuity of the show explained that Fred Sanford was away in St. Louis attending his cousin's funeral and leaving his friend Grady (Whitman Mayo) in charge of the business. NBC sued Foxx and as part of the settlement, Foxx later returned. Foxx had taped 18 of that season's 24 episodes before Fred "left for St. Louis." The show was still quite popular when it was cancelled in 1977. In 2007, Time magazine included the show on its list of the "100 Best TV Shows of All Time". Sanford and Son was a ratings hit through its six-season run on NBC. Despite airing in the Friday night death slot, it managed to peak at No. 2 in the ratings (behind All in the Family, and ranked less than one ratings point behind during the 1974-75 season). The series was produced by Norman Lear and Bud Yorkin's Tandem Productions, which were also responsible for All in the Family. The two shows had a number of things in common. Both were based on popular British sitcoms and both were pioneers of edgy, racial humor that reflected the changing politics of the time. Both series also featured outspoken, working class protagonists with overt prejudices. However, Sanford and Son differed from All in the Family and other Norman Lear shows of the era in that it lacked the element of drama. Sanford and Son helped to redefine the genre of black situation comedy. Due to Lear's commitments to his other series that were on the air at the time, and the relative distance among taping locations of other Tandem shows (as Sanford and Son taped at NBC's now-former Burbank facility, while the other shows such as All in the Family, Maude, The Jeffersons, and One Day at a Time were recorded at either CBS Television City or Metromedia Square, both in Hollywood), he did not have as much day-to-day involvement in Sanford and Son as he did with the other Tandem series, leaving the show-running to Yorkin. As noted, the show was taped at the NBC Studios in Burbank, California; an exterior shot of the NBC Burbank lot was featured in the season five episode, "Steinberg and Son". The storefront, seen only in the opening credits, stood at 10659 West Magnolia Boulevard in North Hollywood. This same storefront, minus the "Sanford and Son" sign, can also be seen in Emergency!, in the episode titled "Alley Cat," filmed in 1973. Foxx did not appear in nine episodes due to his conflicts with the series producers Bud Yorkin and Norman Lear. Foxx was absent from the third season's final six episodes and the first three episodes of the fourth season (in which the episodes were held back from broadcast and aired later in the season). The series continued with Fred's best friend Grady Wilson stepping in to serve as guardian for Lamont. The pickup truck depicted in the series is a 1951 Ford F1. It was purchased at auction after the series ended and was later leased back to NBC for the spin offs Sanford Arms and Sanford. It has changed hands a few times over the years, eventually purchased by a real life junk dealer, Donald Dimmitt of Dimmitts Auto Salvage, in Argos, Indiana. Most recently it was purchased from Dimmitts Auto Salvage by Tim Franko and Jeff Canter, owners of BlueLine Classics, a classic car dealership in North Royalton, Ohio. The truck has been preserved by BlueLine Classics to its true condition as seen on the TV series and is displayed in the BlueLine Classics showroom. Titled "The Streetbeater", the theme music was composed by Quincy Jones through A&M Records and released on record in 1973. Although the song did not reach Billboard status, it has maintained mainstream popularity and is featured on Jones' greatest hits album. After the series was canceled in 1977, a short-lived continuation featuring the supporting characters titled Sanford Arms aired. Whitman Mayo starred in a short-lived spin-off series, Grady, during the 1975–76 season. In 1980–81, Foxx attempted to revive the show with another short-lived series titled Sanford, but Demond Wilson refused to reprise his role as Lamont Sanford for the new series. Sony Pictures Home Entertainment has released all six seasons of Sanford and Son on Region 1 DVD between August 2002 and June 2005, with a Complete Series box set following in 2008. ^ a b "Sanford and Son". TVGuide.com. ^ Brooks, Tim and Earl Marsh, Complete Directory to Prime Time Network TV Shows, Ballantine Books, 1992, pp. 778-9. ^ Brooks, Tim; Marsh, Earle (2007). The Complete Directory to Prime Time Network and Cable TV Shows 1946-Present (Ninth Edition). Ballantine Books. p. 1686-1688. ISBN 978-0-345-49773-4. ^ "SANFORD AND SON – 10 FACTS ABOUT FRED, LAMONT, AND THE 1970S CLASSIC". getTV. Culver City, California: Sony Pictures Television Networks. ^ "TV Listings for September 24, 1976". TV Tango. Retrieved January 1, 2017. ^ "TV Listings for December 7, 1976". TV Tango. Retrieved January 1, 2017. ^ "Sanford and Son FAVORITE I'VE WATCHED THIS 276". TV.com. Retrieved 9 May 2013. ^ Moor, Bill (2006-07-26). "'Sanford and Son' truck back on the road". South Bend Tribune. Retrieved 2008-09-02. ^ "Sanford & Son Theme (The Streetbeater) by Quincy Jones". ^ "Manhattan by Quincy Jones @ARTISTdirect". Wikimedia Commons has media related to Sanford and Son.